Dark boundaries formulated by dissonant progressive saxophone rock. This is moody and avantgarde in its atmospherics. It is also Van Der Graaf Generator at their creative peak. The album begins with Lemmings, a song that has a very nice flow as it careens anywhere from flamboyant sax pounding, to mellow organ floating. The 12 minute long song has all of the characteristics of your classic VDGG. It has Hammill's vibrant and diverse vocal skills treated well with the implementation of a jazzy saxophone romp and tight rhythm section. Following on the dissonant heels of Lemmings emerges Man-Erg. This track has a much more dark, Gothic touch added as a majestic organ flourish and angelic melodies supplement Peter as he croons like a plagued cherub in some ethereal light. The song swells powerfully and the vocals must be commended for their masterful control. To be honest, the entire band is usually at the top of their instrumental game. Not often do they let their pretenses get the better of actual songwriting and performance. The song then breaks down into screams signaling the dark and King Crimson-style drop into dark jazz screeching hell. The drumming is heart stomping, and it becomes a terrifying onslaught as the vocal screams paint a bleak and insecure painting full of fleshed out and technical beauty. Each of the three songs on Pawn Hearts contains at least several excellent musical ideas, as each track evolves and transforms, becoming many a style of threatening pretty beast. Hardly a single note seems to be out of place, and the focus switched from guitar to sax is a refreshing change of pace. The harmony and interplay is wondrous. I've said it before, but the sheer control and force of will behind Peter Hammill and his opera voice has to be heard to really be classified. This is music crafted to be emotionally striking, and the lyrics are up the the usually high quality for this band. And we come to the herculean side two, the 23 minute long epic A Plague Of Lighthouse Keepers. Massive in scope, and awe inspiring in presentation, the song drifts stately as it grows and bends to the will of a tasteful and brooding atmosphere. 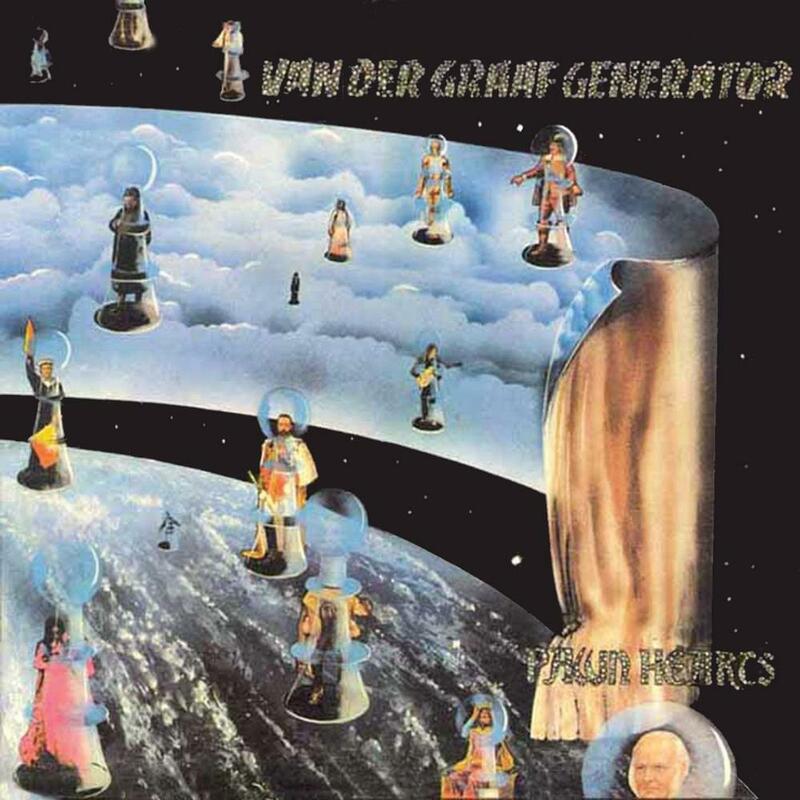 Van Der Graaf Generator have always been good at preserving an atmosphere, but this album is drenched in a very strong one, and the final track, especially. The lilting flute and saxophone notes that break off into space traveling fancy is highly enjoyable. I must caution those who are very biased agaist atmospheric avantgarde music, or dissonance of any kind, as the songs here utilize a broad range of diversity, and you'll get a lot of dissonant sax work. The lush organ work is almost religious in the way it crescendos and rolls forth. This leads Plague to a heart squeezing build, to which every band member puts their developed oar into the meld. This also brings me to the one main criticism I can give of this album, and what makes it only slightly less enjoyable than Godbluff for me. The dissonance used herein is dark and enjoyable, but I almost feel as if they rely on it too much to push the musical ideas forward. This slightly lessens the diversity, but isn't enough to ruin the experience by any means. With Pawn Hearts, VDGG have given us a very dark and atmospheric trip through a wide array of bleak emotions. Hammill's vocals are astounding, and the band's playing is very cohesive. The songwriting is put above pretentious noodling, and everyone gets a chance to shine. The album sometimes relies too heavily on the sonic dissonance, but the melodies are fantastic, and you'll be hard pressed to find an album with such a well defined and enjoyable mood. Essential VDGG.